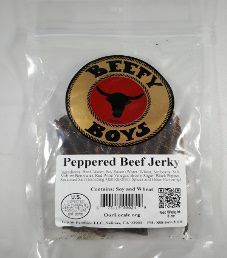 The next review on Beefy Boys will focus on a 3 ounce/85 gram bag of their Peppered flavored beef jerky. This jerky is advertised as a secret family recipe dating back to 1963, which has not changed to this day. The bag was kindly submitted by the Beefy Boys Jerky Co. team. 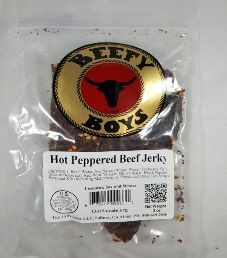 The next review on Beefy Boys will be on a 3 ounce/85 gram bag of their Hot Peppered flavored beef jerky. This jerky is advertised as each strip being completely covered with smoking hot red chile peppers, where the finished product looks completely orange. The bag was graciously submitted by the Beefy Boys Jerky Co. team. 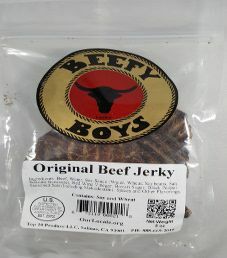 The next review on Beefy Boys will focus on a 3 ounce/85 gram bag of their Original flavored beef jerky. This jerky is advertised to be an awesome conservative all natural style of beef jerky because it is milder than their other flavors. The bag was graciously submitted by the Beefy Boys Jerky Co. team. 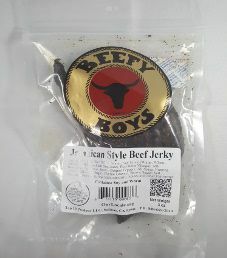 The next review on Beefy Boys will be on a 3 ounce/85 gram bag of their Jamaican Style flavored beef jerky. 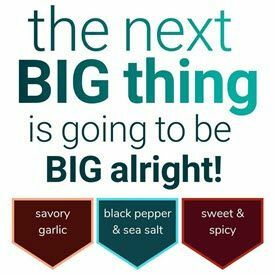 This jerky is similar to their long, very thick strips Reserve flavor, but with a jerk sauce added. The bag was graciously submitted by the Beefy Boys Jerky Co. team. 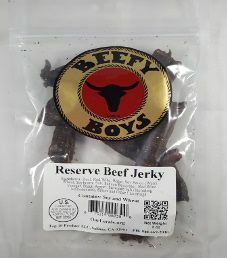 The next review on Beefy Boys will be on a 3 ounce/85 gram bag of their reserve flavored beef jerky. This jerky is advertised to be cut into long, very thick strips, using the same marinade as their peppered flavor except with a hint of red wine. The bag was kindly submitted by the Beefy Boys Jerky Co. team.